Last week, based on theory, I made the claim that group selection could act on interactions among individuals. At the risk of exposing my over-inflated ego I think that one of the best experiments demonstrating this is my postdoctoral research on selection in two species communities of Tribolium (Goodnight 1990. Evolution 44: 1614-1624; Goodnight 1990. Evolution 44: 1625-1636). As I discussed last time, Wade’s lab was convinced that it was interactions among individuals that was the reason that group selection was so effective. The question became how to demonstrate this. As with any experiment, the question is how to create a weak link that can be exploited to get at the question you are interested in. I realized that there was no easy way to look at within species interactions, but that a two species competitive system provided a seam across which I could distinguish these inter-individual interactions from within individual genetic effects. In particular, there were two things to look for. First, I could look for correlated responses to selection in one species due to selection on the other species – such effects are prima-facie evidence of interspecies pleiotropic effects, since they can only be mediated by interactions among individuals. Second, I could examine the effect of modifying the community structure. 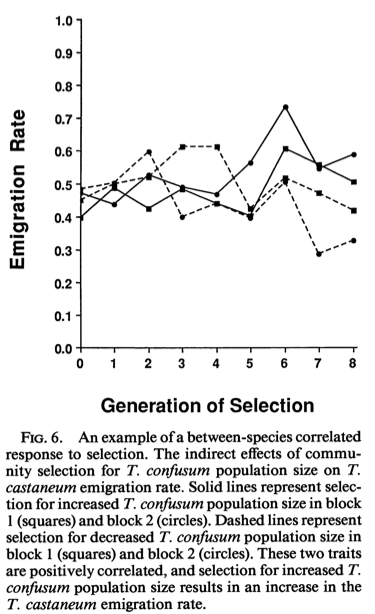 If removing the competing species affected the response to selection this would indicate that the competing species was an important part of the environment. More importantly, if changing the strain of the competing species affected the response this would indicate that the specific coevolved strain was important in the response. For my postdoc I moved to the Mertz lab at the University of Illinois at Chicago where I did an experiment that involved sixteen independent selection experiments. 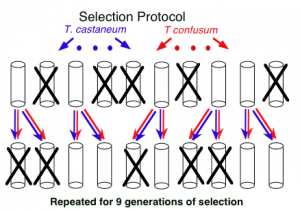 Each experiment was a set of ten vials set up with 16 T. castaneum and 16 T. confusum. 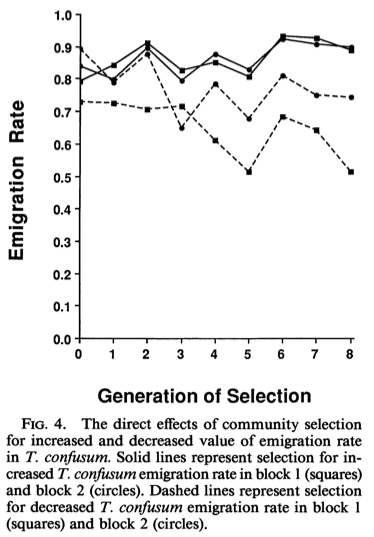 The populations were allowed to grow for a generation and four traits were measured (I am resisting the temptation to describe the treatments in detail): population size in each species and emigration rate in each species. In each selection treatment I selected in one direction on one trait. 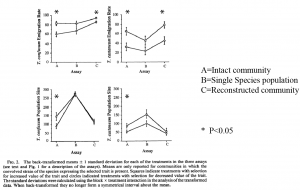 Each selection treatment was replicated. (4 traits X 2 directions X 2 replicates = 16 selection treatments). In each selection treatment the five most extreme vials were selected. 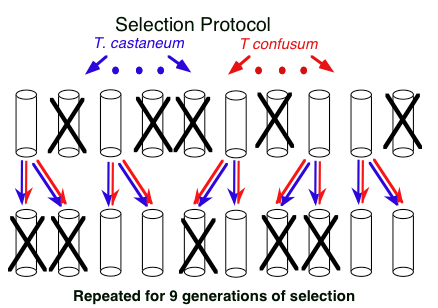 For example, in the selection treatments for increased T. castaneum population size, the five vials with the largest T. castaneum population size were retained, and the remaining five discarded. Each surviving communities were each used to set up two communities in the next generation bringing the total back up to ten. The selection protocol. Selected communities each founded two communities in the next generation. Importantly, the two species were transferred together, resulting in the potential for community level heritability. As with all group selection experiments (and I do mean ALL group selection experiments), there was a rapid direct response to selection. It is this last result that is perhaps the most important. 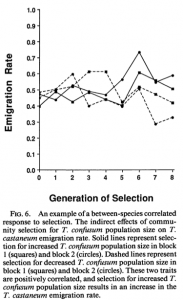 That is, the between species correlated responses to selection can only occur if selection on one species is causing heritable changes that affect both species. Of course, lets get real here, we know what is going on. The high population vials are really not pleasant places for the beetles to live. Those treatments selected for high population size of either species became over crowded, and the beetles were more than eager to emigrate. However, just because we have a good idea of the ecological cause does not alter the fact that this is interspecies pleiotropy. At the end of the selection experiment I did three assays. Assay A was simply the intact community in the generation after the last generation of selection. 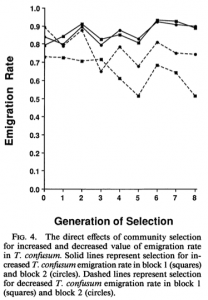 In assay B I broke up the communities into single species populations. In assay C I again broke up the community, but then added back a naïve test strain of the opposite species. In all of the intact communities (assay A) there was a significant difference between the up and down lines. This difference entirely disappeared in the single species populations (assay B). 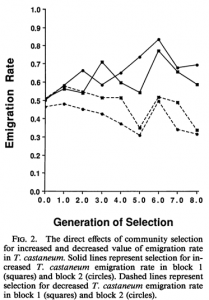 The “reconstructed” communities were significant for emigration, but not for population size. 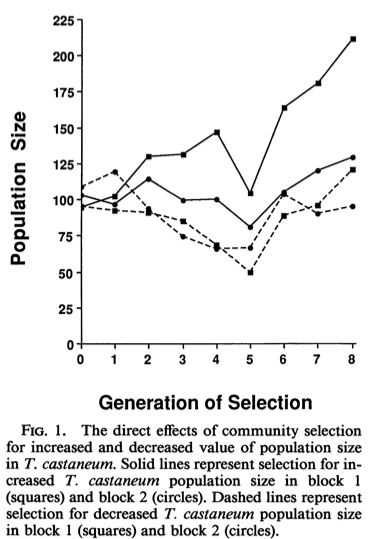 Assay C tells shows that for population size the response to selection was completely (and based on the figures dramatically) dependent on the genetic identity of the competing species. Ecology clearly plays an important role. 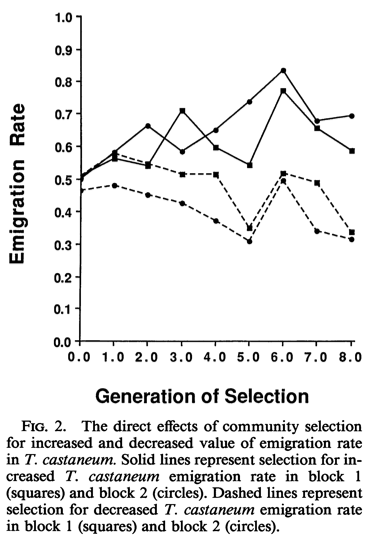 For emigration the response to selection was restored when the ecology was restored in the reconstructed communities, but for population size it is clearly more than that: It is apparent that indirect genetic effects are contributing to the response to selection. So group selection can act on interactions among individuals. One can ask why this isn’t just Dawkin’s extended phenotype, and why this cannot just be reduced to selection among genes, albeit genes in another species. The difference comes in how an individual gets its fitness. In the treatments in which I was selecting for large population size in T. castaneum, any behavior on the part of the T. confusum (read changes in cannibalism rate) that increases the population size of the T. castaneum will increase its chance for survival and thus its fitness. However, it increases its chance of survival because it increases the chance of the groups survival. The only way that lowering of the cannibalism rate in T. confusum increases the strains fitness is by virtue of its effect on the community, and with it the average fitness of all members of the community. 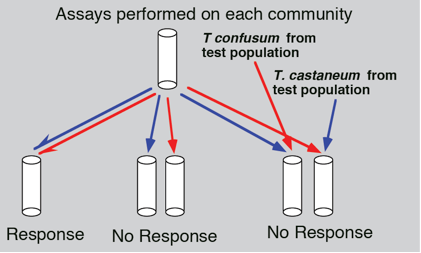 In a single panmictic group a change in cannibalism would change the population size of T. castaneum, but there would be no mechanism for that to feed back to an increase in fitness of the T. confusum strain or individual. In short, we are left with the same conclusion I arrived at last week. 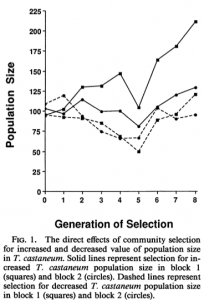 Community selection, as with group selection, leads to adaptations that are qualitatively different than adaptations that are possible when selection is acting at a lower level. This entry was posted on Wednesday, October 30th, 2013 at 11:23 am and is filed under Uncategorized. You can follow any responses to this entry through the RSS 2.0 feed. You can leave a response, or trackback from your own site.